Whether you are using Blogger or WordPress, resizing your images is going to be critical with the more posts that you write. Each system has a finite amount of storage space for your media and images take up a lot of space, so getting your images to the optimum size for your blog is essential. A huge image takes up more space in your storage than the perfectly sized image for your blog. 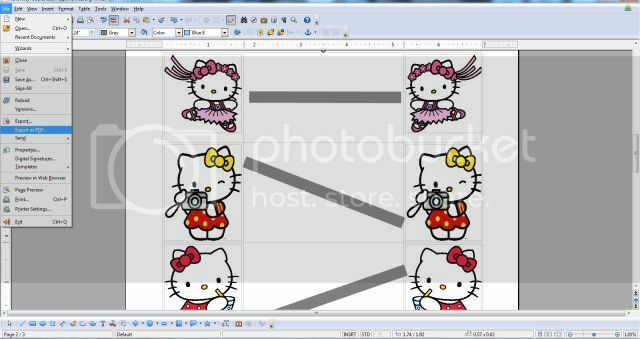 Here’s how to resize images using PicMonkey, the free online picture editor. On Blogging with Kids we have worked out that an image size of 640 pixels wide is best for our main post space when we want a large picture – this leaves a little white space around the edges of the image and is eye-catching. However, our camera’s generally produce images that are considerably larger (my little point and shoot does ones that are around 1536px wide and take up quite a bit of memory, so not good for using directly onto the blog). PicMonkey is a great online FREE tool to edit your photos and you can resize the images very easily. 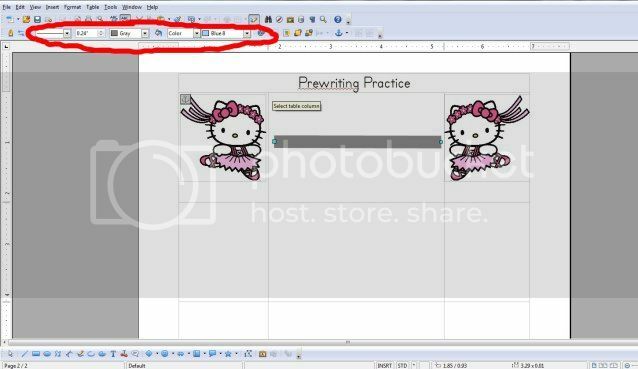 If you want to, you can resize the image in PicMonkey when you start to edit the picture – using the BASIC EDIT function in the tool bar at the side go to the bottom of the list and click on Resize (the cookie cutters), or you can resize once you have edited your image. Make sure that ‘KEEP PROPORTIONS’ is checked, otherwise you could end up with a very odd (disproportionate) looking image and then adjust the first setting (which is the width) to your blogs ideal width and click ‘APPLY’. Have you found out what is the optimum size for images for your blog? How to create and submit a sitemap for your blog. A very simple SEO tip for you today. What makes it so simple? You don’t have to create your own sitemap for Blogger. Blogger automatically creates it for you. All you have to do it submit it. Going back to the 15 Minute SEO Checklist, a sitemap is on the list! And they say that spiders love an up-to-date one. So let’s do what we can to make sure that happens! Just follow these step by steps. Really, its pretty easy! How to find your sitemap? Now Google will find you. Congratulations on submitting your sitemap! Are you on a self-hosted WordPress blog? Submitting your sitemap is even easier. Download and activate the Google XML Sitemap Plugin. Alright. So you’re doing everything right. You’re writing awesome content. You’ve got your social media sites set up (at least the main ones like Facebook, Twitter, Google Plus and Pinterest). You’re working on SEO and getting your keywords down. But the numbers for pageviews just aren’t coming in. The followers aren’t happening. What can you do to get some blog growth? First of all, it takes time. Sometimes, a lot of time. Slow and steady growth is probably best actually, when it happens this way you get followers that stick around and want to hang on to your every word. Secondly, don’t look at numbers on a day to day basis, step back and look at it from month to month. Are the numbers growing steadily in an overall manner? Don’t be discouraged by a few bad days here and there. However, there are a few other things you can do to get your blog out there for people to see! Pinterest. I’m just restating this one because its a big one. Collaborate with other bloggers to build a bigger and better Pinterest board for your followers! Work in numbers! When you join others’ Pinterest boards, you’re sharing your pins with their following. Don’t go all collaborate though, you need to keep yourself as yourself too. Don’t put all your eggs into just Pinterest though. Comment on other blogs. This is the best way to build one on one relationships with other bloggers. Why would you want to do that, bloggers aren’t your readers or followers, they’re actually competition? A big secret to blogging. Bloggers love to share other bloggers’ ideas with their readers! Build a relationship with others and soon you’ll be sharing each others’ posts left and right. Getting your posts in front of their readers. Yay! Reply to your comments. Same concept as commenting on other blogs. It builds relationships. But this one brings in your own readers. It makes you a human to your followers and makes them want to come back for more conversation with the next post. Guest posts. This one is the hardest and most time consuming to me. But, can benefit you the most too. Guest posting on a blog that’s bigger than your own is good for a couple of reasons. One, it gets your name, your idea, and links to your blog in front of all their readers, first hand. Secondly, it also helps with SEO to have your links associated with a blog that’s bigger than yours! And an even bigger bonus maybe, it gets you in good with that blogger (a relationship has formed), they’ll have respect for you and your content and more likely want to promote you down the road. Submissions sites. Submission sites are sites such as The Crafty Crow, or UCreate with Kids that tend to feature other bloggers’ posts on a regular basis, and a lot of times as a single post to really let you shine. There’s usually a submission form, or an email contact, on their site to submit one of your posts that is fitting for their site. You then just wait, hope and pray that they like it enough to feature it. And when they do, shout it to the world and share it with your readers, and then check your stats because you’re sure to see some good pageviews coming in. Collaborate with others! Once again. I feel like I’m pounding this into you. Building relationships with other bloggers is an amazing avenue to gain followers, promoting each other, and so on. So, work together to bring your readers something even more brilliant than you could do on your own. Believe me, after doing The Heart Project and raising over $2300 for The American Heart Association, I know it pays to work together in numbers. We’ve created ‘Events‘ here on Blogging With Kids to make collaborating with each other easier. You can see all the happenings in one place and get a group started to work on your projects! Link up to the happenin’ parties! That’s linky parties! Find parties in your niche, like It’s Playtime!, Tuesday Tots, Learning Laboratory, and so on. Usually these are weekly parties to share a post that is fitting (read the rules of the specific party) and browse others to get new ideas and, once again, find other bloggers and start building relationships with them! Once again, browse the Events here on Blogging With Kids. Members of the Learning Zone Community have added their linky parties so we make sure we don’t miss any! There’s always other ways to share your blog posts to gain new readers, such as StumbleUpon. Every once in awhile you might get a nice spike in traffic from them. Also, giveaways are a way to get new followers (but not necessarily readers), but they’re not the best quality of follower, and you really have to know where to promote your giveaways to make it a successful one! Do you notice anything that’s repeated throughout the list? Build relationships. This is the fun part of blogging, and also a crucial part of getting your blog out there more. Be social, interact, ask questions, join forces. Become friends! So let us in on your secrets. What do you do to gain new readers, followers, or just to get your name out there one more time? How do you get your blog seen? This Blogging Tip is brought to you by Erin of Royal Baloo and Logi Bear Too! She’s wonderful at making printables and sharing them on her blog, and she’s sharing how to she does it all here on Blogging With Kids! Erin also recently shared some photography composition tips too! 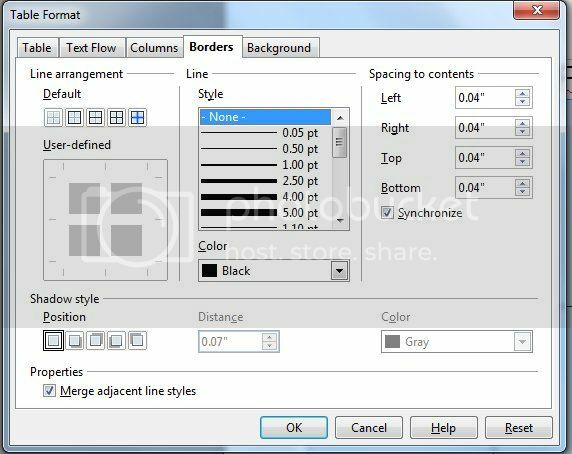 I use gimp to alter any clipart I need or to make general changes like rotating or resizing. Gimp is basically the free version of Adobe Photoshop but with a bit of a learning curve. As far as free clipart comes, I pretty much only use those sites. If I can’t find what I want there, I go to etsy.com. Now that the basics are out of the way, I’m going to include some techniques I use in OpenOffice. On this page I don’t want the tables to show up. Making them invisible is very easy luckily! Right-click in the table, select Table Properties and under the tab ‘borders’ select none. Now, I’m going to add a picture to the first cell on the left and the cell on the top right. I want these pictures to be facing each other so I have to flip one horizontally. This is one of the few changes I can make to images in OpenOffice Write. After inserting the picture simply right click on it, select Picture… and under the ‘picture’ tab click the box next to horizontally. I’ve got both pictures how I want them and I want a line in between. This particular sheet is for toddlers so I like to do a thick line. There is a line tool in the lower left hand corner. Click on it and you can adjust the line thickness at the top. You can see my settings in the picture above. I change the color to light gray and adjust the thickness until I find what I want. Then you just draw your line wherever you want it! After you’ve finished all your pages you are ready to export! Simple click on File –> Export to pdf. 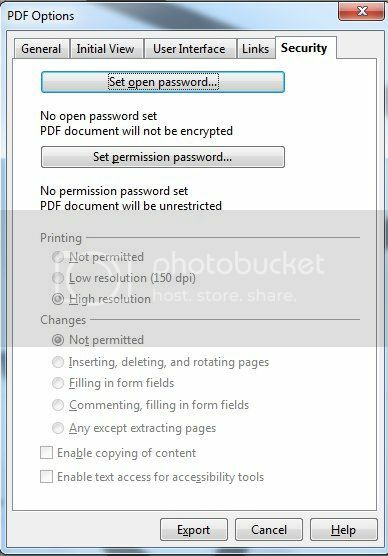 I strongly suggest setting a permission password so your PDF cannot be tampered with. This is also a requirement of some clip art artists. When you select export to PDF you will get a popup. Click the security tab and set the permission password. The next step to sharing your printable is uploading it to the internet. If you have your own host I recommend uploading it to your FTP directory. This varies based on host so if you don’t know how to do it you’ll have to contact your host. If you do not have your own host there are a few sites that will host files for you for free. The only one I have used is 4shared.com. I’ve had a good history with them and I feel that their website is very easy to navigate. Update your printable and you are ready to share! A lot of bloggers take great pride in the content they share on their blogs (can you blame them? Its their time, their content, their photos, their writing!). Bloggers that blog about their kids especially do. While they want their posts to be shared by you, they don’t want their content stolen and implied to be your own. Sharing others’ content with your readers, fans, and followers is a great way to start your own community. It is a good thing to share! It’s a win-win for both you and the blogger you’re sharing! Do it! While sharing others’ content is great and usually very much appreciated, you can’t just take it and make it seem as if you created it. There is a right and wrong way to share others’ content, photos and posts. If the situation were reversed, would I be happy with the crediting? How would I like someone to share my own content? Did I give credit to the proper person? Let’s share and play nicely, just like we teach our kids to do. Here’s 13 tips on what sharing is acceptable, and what’s not. Copying an entire post of someone else’s. This just is plain stealing. Its wrong. Even if you have permission from the other blogger to use their post in its entirety, Google doesn’t like it. It’s not good for your SEO or the other blogger’s SEO. It needs to be changed up even when you have permission. Copying any more than 3 sentences of content isn’t acceptable. Using photos that aren’t yours without credit. Whether it’s in a blog post or on a social media platform, it’s always best to use photos that you take yourself. You will run into absolutely no gray areas that way. There are times that you’d like to feature a post with a photo. Most bloggers are okay with you using one of their photos with it linking back to their post that includes that photo, as well as text credit and link. This isn’t always the case though, so look for a disclaimer on their site. They may want you to get permission for any photo you use first. When in doubt, ask first. Using more than one photo that isn’t yours. It’s not okay. There’s no reason to use more than one photo of someone else’s. If you are, you’re probably stealing too much of their content otherwise anyway. Stealing ideas without credit. This is a huge gray area. We all know that an idea cannot be copyrighted, right? That said, if you see an idea that you’re trying out, and you blog or write about it, just give the person that you saw it from some credit. This gets to be a gray area because so many ideas are just common ideas that have been around for ages. But if its new to you, and you saw it somewhere before you did it that inspired you (even if you changed it up a tad), the right thing to do is to just to share your inspiration. Absolutely credit any photo that’s not yours. Credit any idea that you’ve been inspired by with a link to their blog. And a helpful hint: Don’t just say from “this post” and link “this post”, be descriptive in your linking and its a boost for SEO for both you and the other blogger! Use only one photo from a source. You should crop it and resize it to a thumbnail size photo, and always make sure to link it to the source. And give it a link in the text too! Always link to the original post (not just the blog homepage) and mentioning the source in the text is always nice. Don’t alter a photo just to take out the watermark. Do not crop out watermarks! Thumbnails of images are great actually, so you can crop for that as best you can. And sometimes a photo of a child’s face that isn’t yours isn’t the best thing to feature. If you can, choose a different photo. If you’re cropping to take the watermark out, it makes it look like you’re claiming it as your own. Be better than that. When in doubt, ask first. Share the link to the source. Whenever possible, tag the source’s Facebook page using the @ symbol. You may have to look up their Facebook page from their blog to find the name they use (it’s not always the same as their blog name). Edited to Add: This is a huge gray area of good blog etiquette. If you do decide to share a photo on your Facebook page that is not yours, please remember to do the following. However, please consider that there are bloggers that don’t want you to share their photos on your Facebook page either. And just a link to the blog post is appropriate then when you want to share. Absolutely be sure you know who is the originator of the photo (quotes have a tendency to be floating around with absolutely no credit whatsoever, so be careful with these). I know there’s a lot of instances of improper sharing. If you’ve seen improper sharing, please share it in the comments! I’d love to add it in here as additional unacceptable sharing behaviors!